Last Updated: 7/3/2012 | File Size: 15996 KB | License: Freeware | Downloads: 231 | Developer: Digiarty Software, Inc. 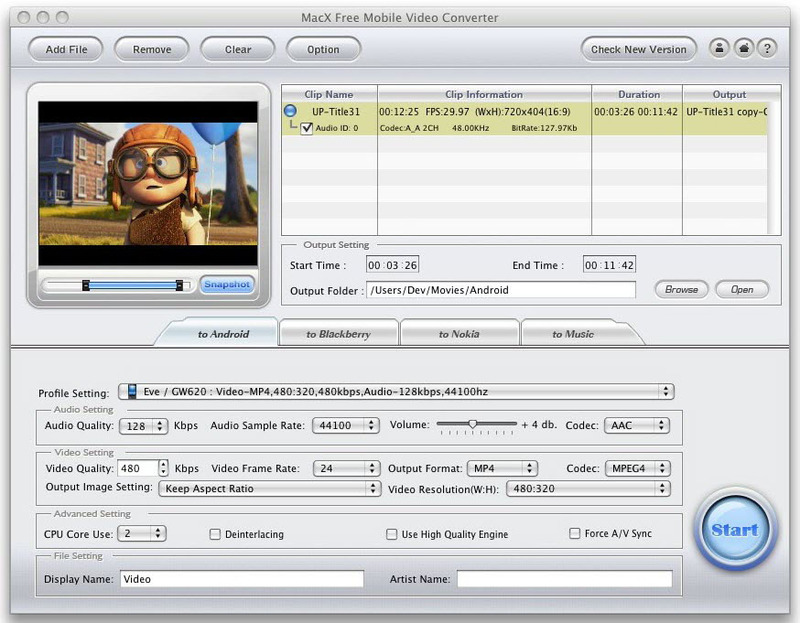 If you are looking for video software that can free convert any video to mobile phone, try MacX Free Mobile Video Converter. It is the best free mobile phone video converter which helps you to convert any video to mobile phone supported 3GP and MP4 formats and then you can play any video with your mobile phone. It can convert both HD and regular videos, including MPEG, RM, VOB, FLV, MOV, WebM AVCHD, MKV, WMV ect to 3GP and MP4 formats which are compatible with mobile phones such as Android, Blackberry and Nokia. With this free mobile video converter, users can also easily extract audio from source video to MP3 music file because of its easy-to-use interface. The adjustable parameters setting could make you get desired video and audio quality according to personal demand. 3. The free mobile video converter can take a screenshot of your favorite scene from video and save it in BMP, JPG format. 4. This fee mobile video converter supports trimming function for Mac users to trim the video segment in order to get smaller file size for the phone; users can also crop the video and get the appropriate image effect to for the screen size of their mobile phone. 5. Rich formats profiles are provided to facilitate your convertion, you are allowed to customize all audio and video settings like Audio Sample Rate, Audio Quality, Video Resolution, Video Quality, Video Frame Rate and Output Image Setting etc. 6. With Multi-core and Hyper-Threading supported, it offers super fast speed of converting video to3GP and MP4 format. Built-in High Quality Engine and Deinterlacing scanner could deliver you the maximum enjoyment. Statement: First, please download the orginal installation package by clicking the download link. Of course you may also download it from the publisher's website. Using MacX Free Mobile Video Converter crack, key, patch, serial number, registration code, keygen is illegal. The download file hosted at publisher website. We do not provide any download link points to Rapidshare, Hotfile, Depositfiles, Mediafire, Filefactory, etc. or obtained from file sharing programs such as Limewire, Kazaa, Imesh, Ares, BearShare, BitTorrent, WinMX etc. Software piracy is theft. If you like MacX Free Mobile Video Converter please buy it.